If you are reading this post and can tell me why it is 'boxed' I would really appreciate your help on how to remove it. This is the second time it has happened. Where am I going wrong? Chez wasn't expecting Claire to do this with a quote from you,do u wish u had pick a quote now?? I hope she listen to you as eating disorder is bad as we have talked. She must love you so much and also respect you. She is at the age when she won't really understand the value of health, but soon I am sure she will change and make you feel proud of her in every way. That is really very sweet of her to present you with this gift: a gift which blesses the giver and the receiver too, a real win win situation. Chez, wow, it is a great quote and aren't you thankful it wasn't longer! and, wow, what a statement of love! I am glad she didn't cut a finger off! About her diet: could you intise her into cooking? maybe initionally just to help you? The process is artful, an opportunity to explore conversations, and there are about a million spices! No lectures on nutrition, just cook, enjoy and eat. Did you read my "Pep Talk"? I wrote it for you. Chez, that is such a beautiful story! Claire clearly loves you very much if she was willing to be inked with words that express who you are! I am not sure how I feel about tatoo's, but I know that I would feel very honored if someone were to pay tribute to me in that way. 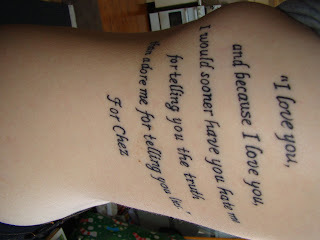 Much love to you, dear Chez. Perhaps to some this would seem a strange thing to tattoo, but I see hope that Claire is accepting of your generous bravery in advising her to the best of your ability. To be a stepmother, or a stepdaughter is no easy feat. Kaz the tattoo was the last thing I expected. I certainly did not see it coming my friend. Rama than you for your welcome, and encouraging comment. I was feeling a little unsure about the whole thing so your comments are most welcome. This is a way of allowing me to view the situation differently. I like that you have pointed out that it is a gift that blesses both giver and receiver. I really enjoy the male perspective! When she lived under our roof, I had her cook in readiness for the day that she would be out there taking care of herself. I have mentioned to her that I feel I have failed. Unfortunately, she then turns it around to say she is a failure. She beats me every time with words as she has a degree in Social Work and is able to quote huge chunks of the text books. She wants to become involved in the music industry which could be behind this. Audrey, I am so very grateful for the positive reinforcement. It has been good for me! I know that she loves me and possibly this is her way of expressing it. In the past, she would simply put words to music in my honour. She does have a picture of her Mother on her forearm, and it is because of that she decided she wished to carry a reminder of me also. Starry, I know you are right my friend. Her path has not been easy either. I often wonder what affect my illness has on her life. My beautiful birthday card arrived today. It is lovely, and very much appreciated. I have mixed feelings about tattooing, but if she's to take something with her through life, then this is a positive thought to take along and a good thing to remember always. Chez, This is another example of the impact you do indeed have on the lives of others. You under estimate your influence, my friend. As for the box issue, I don't have any answers for you there. Why are answers for anything always so hard to come by anyway?? Thank you MM. I would have preferred she found 'another' way to show her appreciation. Must be honest though and say I would not have done it especially on the ribs. Ouch!! Nancy, that is taken as a compliment which is indeed very much appreciated. I do know Claire was very 'anti' when Haydn and I married. She later said - as an 18 year old - that she was very glad that it was me her Dad married. We do have a strong bond and I am very grateful for that. Nancy, seems there is so much to learn with these computer programmes. J Barr one that I am still unsure of. Thanks for your feedback.